I made this simple roasted chicken and potatoes the other night. The recipe is from May's Martha Stewart Living, which is an excellent issue. Go get it! I'm not always interested in Living, but this is a great issue. I have all the recipes flagged. These were great because I had everything other than the chicken already in my pantry or in my garden. I felt very domestic and competent. Just call me Mini-Martha. Preheat oven to 450 degrees. Pat chicken dry with paper towels. Rub chicken with 1 tablespoon oil; season with salt and pepper. Arrange, skin-side up, on a rimmed baking sheet. Roast until golden and a thermometer inserted into thickest part of breast (without touching bone) registers 160 degrees, about 30 minutes. Transfer chicken to a plate. Pour off and discard fat from baking sheet; return chicken to sheet. Whisk together remaining 1/4 cup oil, vinegar, parsley, garlic, and pepper flakes in a bowl. Season with salt. Spoon sauce over chicken and let stand 10 minutes before serving with accumulated pan juices and sauce. Preheat oven to 450 degrees. Cover potatoes with 2 inches of water in a medium saucepan and bring to a boil; add a generous amount of salt. Boil until potatoes are just tender, about 5 minutes. Drain and immediately toss in a bowl with oil and rosemary. (Potatoes will break apart slightly.) Season with salt and pepper. Transfer potatoes to a rimmed baking sheet. Roast, flipping once, until golden and crisp, about 35 minutes. Serve immediately. 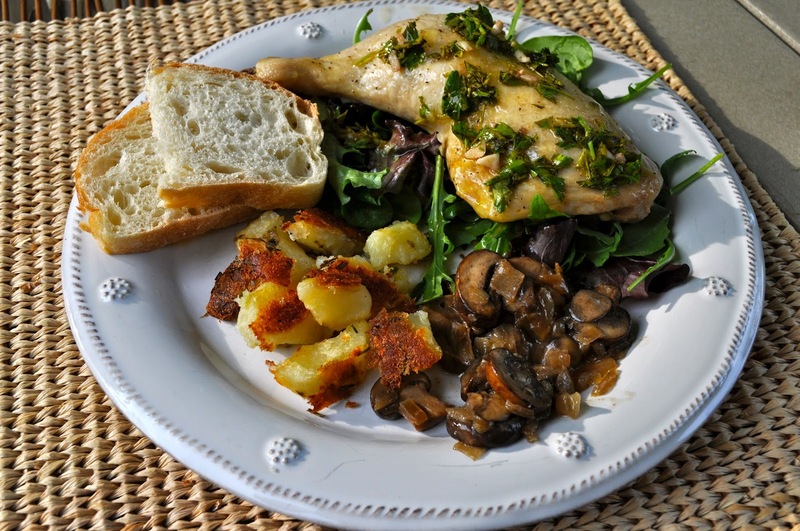 I paired the chicken and potatoes with white wine sautéed mushroom with fresh thyme and greens dressed with the chicken sauce and a touch of balsamic vinegar. 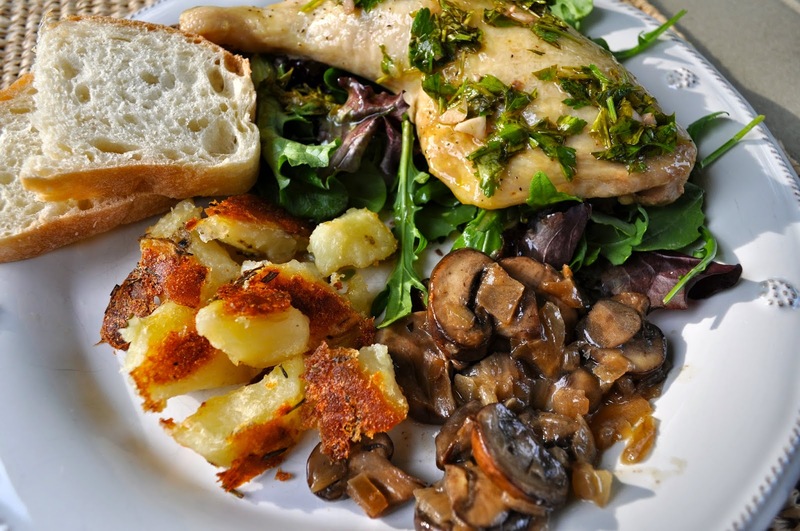 Make sure you have some good French bread for mopping up the pan juice from the chicken- it's the best part! We ate outside and had a glass of white wine. 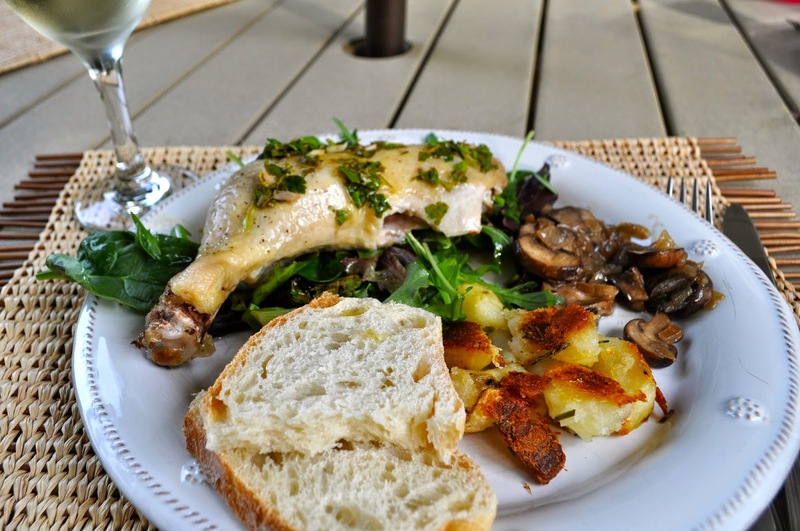 I felt sooo European with my simple fresh dinner enjoyed al fresco. Then I looked over to Dell Harper who was dipping bread into ketchup. Illusions of French countryside living dashed immediately by the toddler clad only in a diaper. C'est la vie! What a beautiful dinner! I would have felt pretty fancy too - especially with some of it coming from your garden. Blaire and Dell Harper would be good buddies - B's yet to find something she doesn't think is improved by ketchup. Thanks for the heads up on this month's issue - I also am usually MEH and just flip through it, but I'll have to go grab a copy this week. I love recipes like this - thanks!! Is it wrong I'm making those potatoes to serve with hotdogs (ALL KOSHER BEEF ORGANIC FANCY WHOLE FOODS HOTDOGS) (but still) tomorrow? Decidedly less Euro.